I love apple bread any time of the year! More importantly, I love the warmth it brings to my home and that wonderful apple cinnamon aroma that lingers for a day after! Through the years, I've tried several recipes until I finally found this one and it's the best I've ever had! This recipe is very moist, wonderfully soft and best enjoyed with a cup of hot tea in the winter or sweet iced tea in the summer. Peel and core the apples. Dice into small cubes, set aside. Mix softened butter and sugar in a large bowl. Add eggs and milk, mix well. Add flour, baking soda, baking powder and salt to the butter and sugar mixture and blending well. Mix in the apples. Lightly mix in the optional pecans. Carefully pour mixture evenly into 2 greased and floured loaf pans and bake at 350 F for one hour. 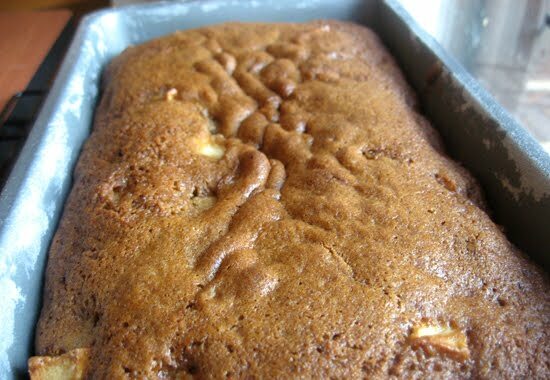 Remove from oven and let rest in the loaf pan for 10 minutes before turning it out onto a wire rack to cool. ***If your oven runs hot, it's been cooking less than an hour and the bread looks ready, reduce the heat to 300 F or lower and continue cooking for an entire hour or your bread will be raw in the center.